To finish up this series, I wanted to give you all some fun ideas you could do with your book club that are a little out of the ordinary. Disclaimer, I've never done this. I recently read it at Book Riot and thought it was a fabulous idea. For this meeting, everyone brings a book (either the actual book or a print off of the summary and vital info from a site like Amazon or Goodreads) about a book that they hated. Two things will come out of this. For one thing, it is just loads of fun to complain about books. I know that sounds a little sacrilegious, but let's face it, it's true. However, you will also find out that one person's trash is another person's treasure. When everyone has the same opinion of a book, it is sometimes hard to hear everyone's actual opinion. It is when people disagree that you really get to hear what other people think. This one is simple. Everyone brings books they've read and want to unload, dump all the books on the table, and then go at it. Of course, this only really works if you are in a group with people who tend to buy books rather than buy them. On of my old book clubs used to do this about once a year and it was a great time. Everyone makes a dish to share out of their favorite cookbook. Then, they bring the dish for a potluck AND the cook book to discuss (and, if you want, copies of the recipe you made). There is usually a little organization needed so that it doesn't end up that everyone brings dessert or the such. This is another thing we did with my old book group*. We normally scheduled this for December, but we would choose a book to discuss that had been made in a movie. Because we met a people's houses, it needed to be a movie available on DVD. Then, at the meeting, we'd watch the movie and then discuss both the book and the movie. *Now, I have to admit to a little bait and switch. I just gave you some fun ideas, and now I'm going to talk about something not fun: the Death of the Book Club. Look, nothing lasts forever. I've been in groups that have died, but for different reasons. Sometimes things just fizzle. I referred to my "old book group" a couple of times. That particular club is an example of one that just drove its course. For various reasons, people had to leave the group until it ended up with just myself and 2 friends. Yes, we are still friends--good friends--and one of them has joined my current book club (the other has been invited but the schedules just haven't worked). The thing was that we were already great friends AND we all had similar tastes in books that it just made it hard to keep the group going. We tried to invite more people but, honestly, I think the fact that there was a core group of 3 people who knew each other so well may have been off-putting to some people. We also tried to keep the group going with just the 3 of us but, because we knew each other so well and had such similar tastes, we just weren't challenged the way that we felt we needed. I've also been in groups that ended more abruptly--mostly, the leader just quit. 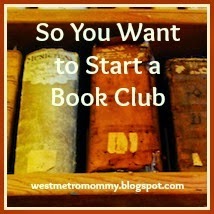 I firmly believe that if you start a book club, you should not feel that you are tied to it. However, there was no "transfer of power," which I do think should at least be an option when a leader decides to leave a group (my own book club just went through this as our fearless leader and founder moved away--the transition was incredibly smooth!). I guess what I'm saying here is that unless your group ends because you are the last remaining member, you need to treat the group with respect. A book club is about more than just books. It's about relationships and friendships. I hope you enjoyed this series! Please let me know if you have any further comments or have any suggestions for a future series!